I just watched the live stream of the latest Fashion in Motion series with Osman Yousefzada. You can catch the next one at 8 PM (London time) or 3 PM EST here. I’ll have the full pics and recap for you over the weekend if you missed it. The Victoria and Albert Museum hosts live runway events with up and coming designers on a regular basis. Past events have featured Erdem Moralioglu and Giles Deacon. Osman is a bright star in the London fashion sky. He studied at Central Saint Martin’s and launched his Osman label in 2005. 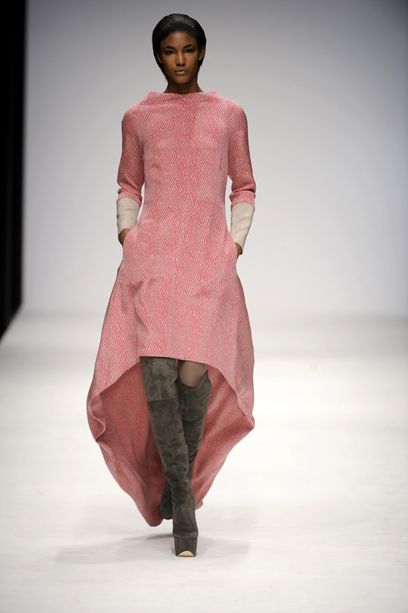 His pieces combine modern Brit cool with an echo of eastern sensibilities, stemming from his Afghan roots. The music of the show matched the clothes perfectly, too – everything from a Nusrat Fateh Ali Khan remix to a mash-up of Blondie and The Doors. Osman, your door of opportunity just opened a little wider. Next Post Mag Rack: Strike Me Red!